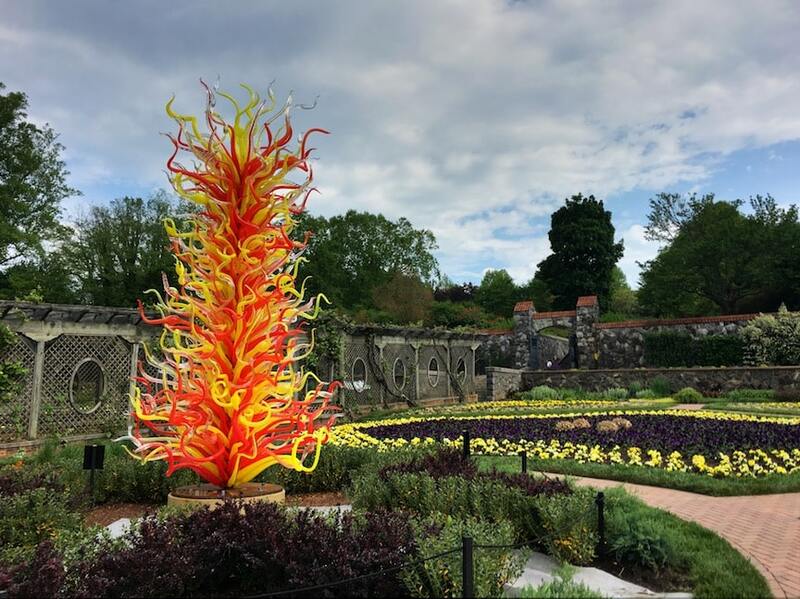 We have been anxiously awaiting the new Chihuly at Biltmore exhibit for months! 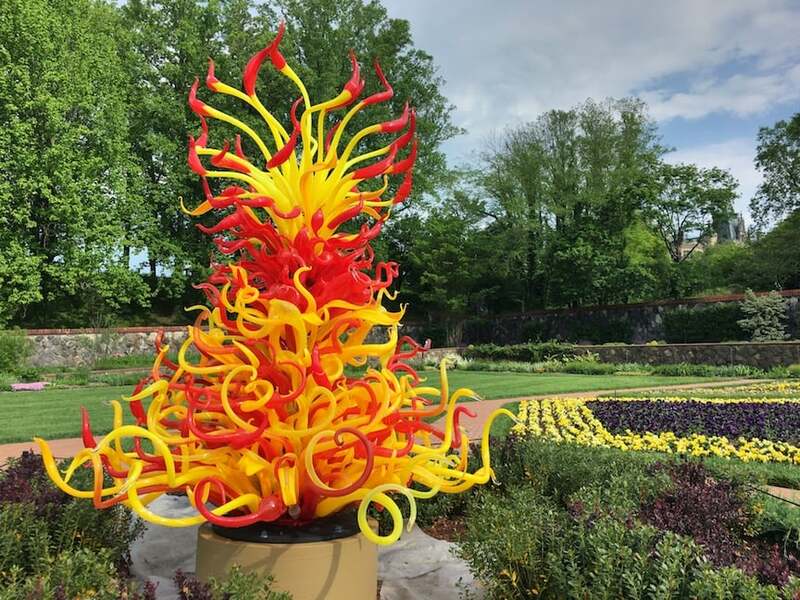 After seeing Chihuly exhibitions in other cities and the Chihuly Collection at the Morean Arts Center in St. Petersburg, Florida, we knew it was going to be AMAZING! 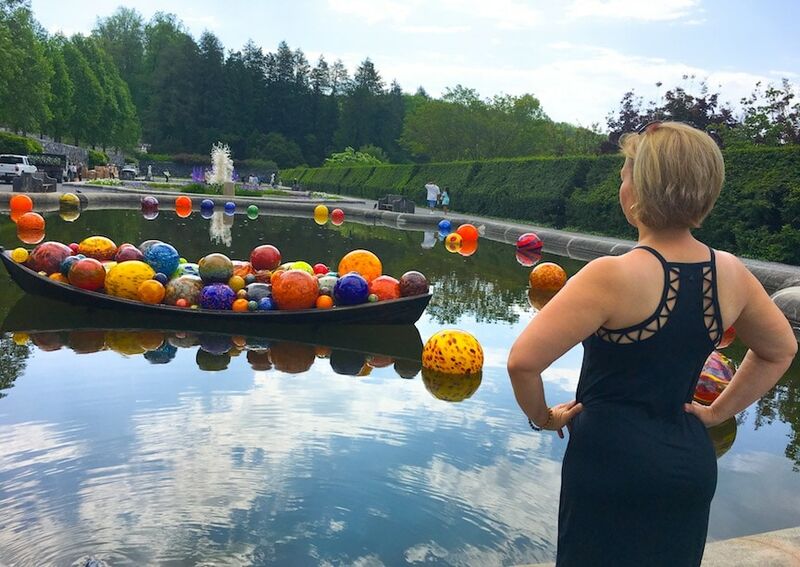 And still, when we serendipitously saw the beginning of the art installations at Biltmore Estate in Asheville, North Carolina before the official grand opening, we were amazed! We went to see the end of the Titanic movie costumes display at Biltmore. 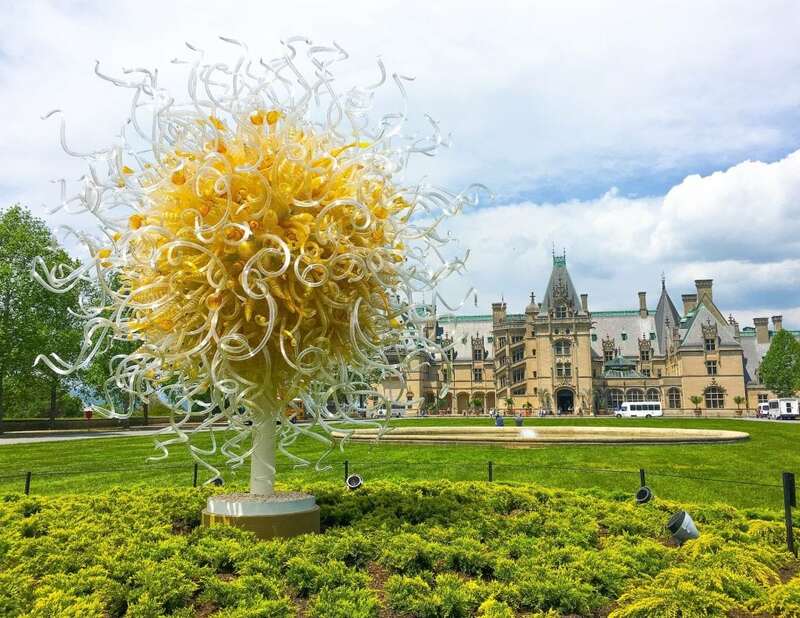 While we were there, we were surprised that the Chihuly at Biltmore sculptures had started to be installed at least a week earlier than the official debut on May 17, 2018. Not all of the Chihuly art glass installations were done. The ones that were installed, though, were absolutely breathtaking! 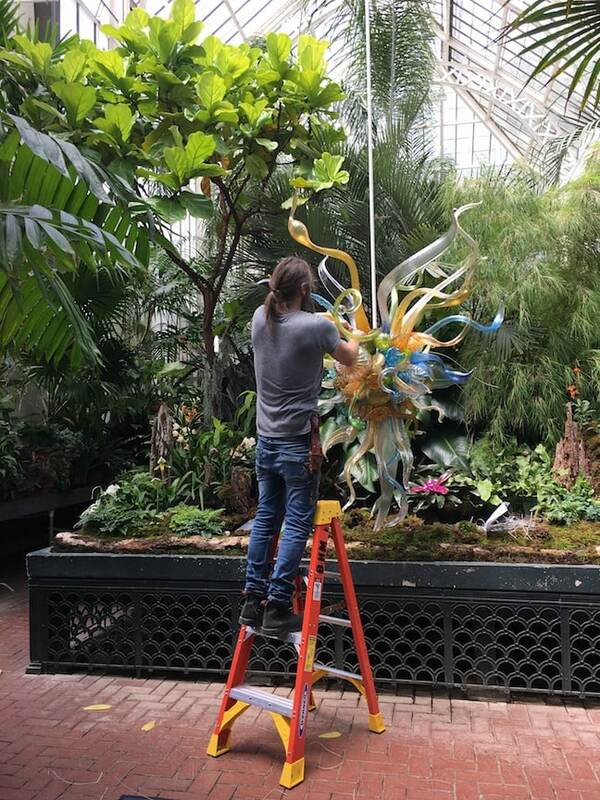 What was surprising was that we could watch the Chihuly artisans doing their job and installing the glass sculptures. The public was allowed to stand right by the art installations, watching the artists trying to assemble each magnificent glass sculpture. The glass artists had boxes and boxes of blown glass pieces that comprised each Chihuly work of art. Yet there was no specific diagram of how to assemble each masterpiece. After talking to the artists, they told us that they practice in the Chihuly studios in Seattle to assemble the glass sculptures. 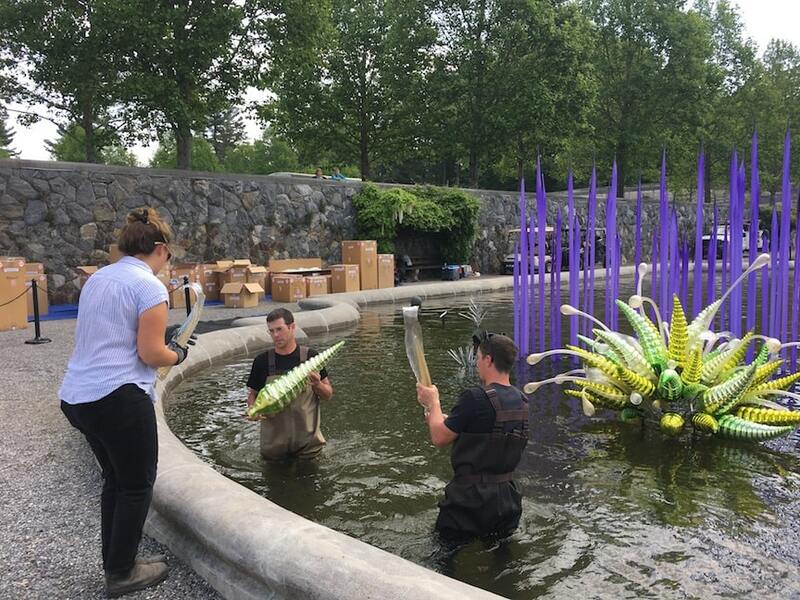 When they get on site, they rely on memory of how to assemble the Chihuly works of art. We watched in awe as the artisans would string a delicate piece of glass with wire, attach it to the framework of a Chihuly art installation, stand back, change their mind, and then place it somewhere else. 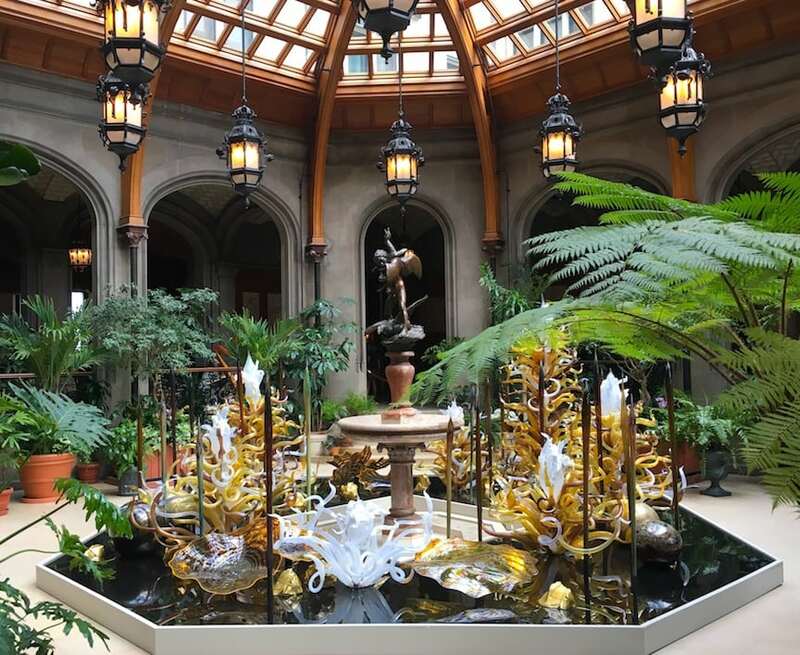 It was fascinating to watch them assemble Chihuly sculptures in the ponds of Biltmore’s Italian Garden, as well as assemble chandeliers in the Conservatory from ground level. The glass artisans were kind and generous. Certainly they had a lot of work to do in a small amount of time. Yet they patiently answered questions as they worked. 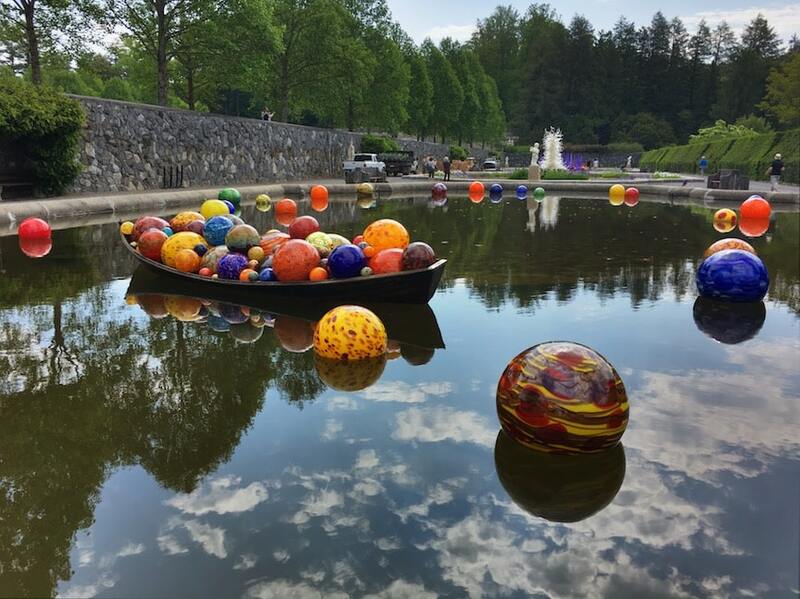 If you just can’t wait until the official debut of Chihuly at Biltmore on May 17, 2018, here are some sneak peeks at the Chihuly glass art sculptures. When we were there on May 10, the Sun in front of Biltmore Estate was complete. 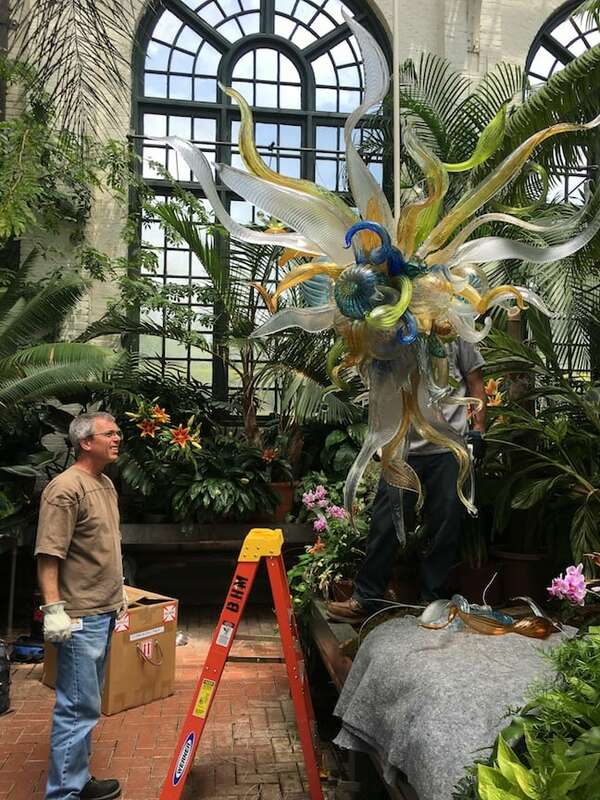 Inside the house, the Winter Garden glass sculpture was installed. 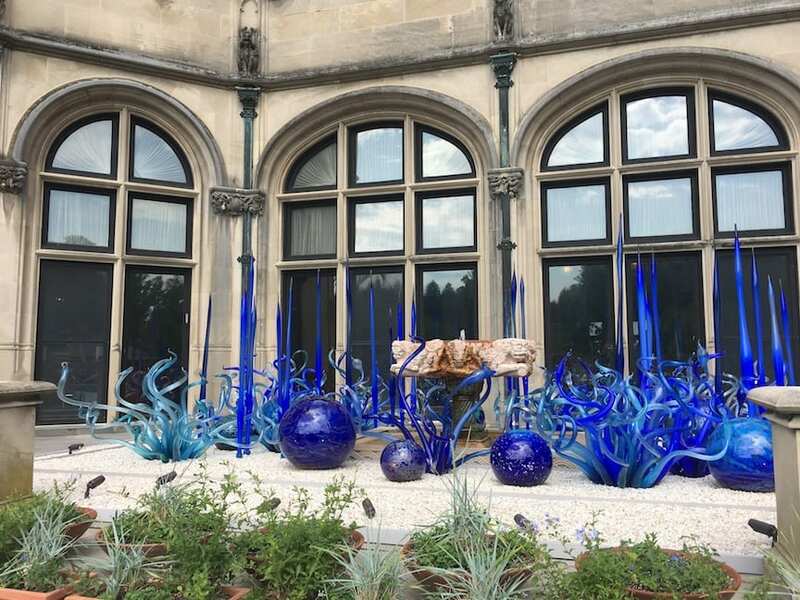 As was a stunning blue Chihuly glass installation in a courtyard that could be seen from inside and outside of the house. The two sculptures were installed in the Walled Garden. The Italian Gardens were almost done, with one more installation being installed by glass artists in waders surrounded by lots of boxes. 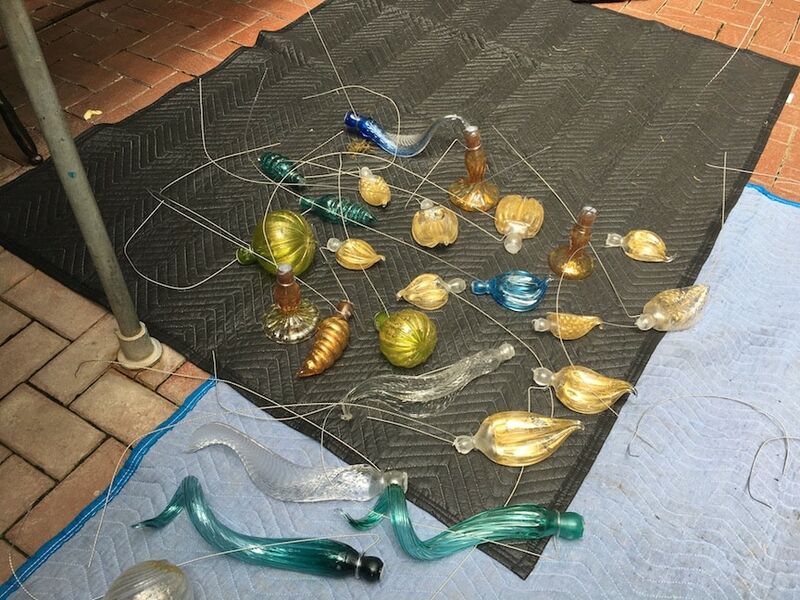 The Chandeliers were being created in the Conservatory. 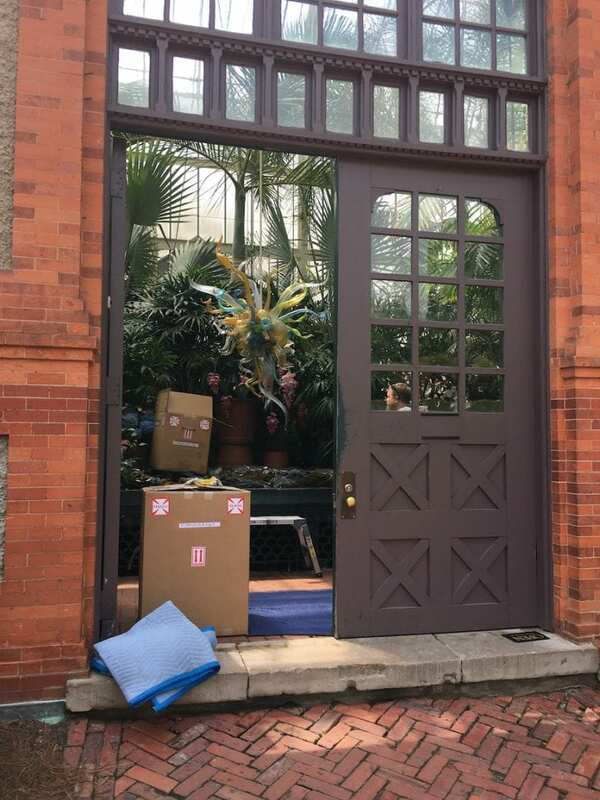 The main Conservatory entrance was blocked off and guests walked through the gardens on either side. Antler Hill Winery only had the framework installed but no glass pieces, yet. I’m always happy to try out the latest collections each season from prAna. When they asked me to choose some sustainable travel fashion to review, it was hard to narrow down my picks for all of the cute choices! Happily, my sustainable prAna clothing transitions from chic to comfy so easily. 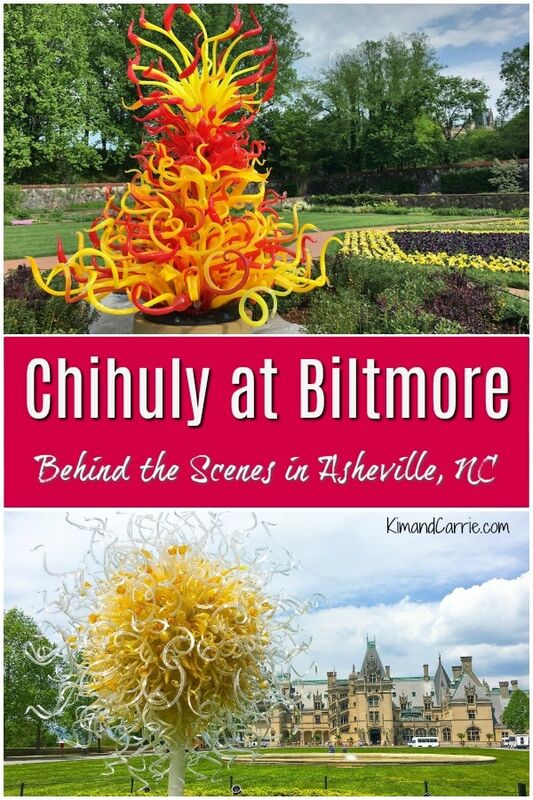 We went to the Biltmore Estate in Asheville expecting to see both fancy Titanic exhibits inside America’s castle as well as strolling through the acres of azalea gardens. I wore the prAna Ardor Dress. It’s so easy to slip on this cute dress that stretches and gives in all the right places. With built-in bra cups, there’s no need to worry about ruining the dramatic look of the back with bra straps. Made with recycled polyester and a touch of spandex, it easily transitions from walking or hiking to brunch with the girls or a day of shopping. For upcoming days at the pool, I also chose a Lahari one piece swimsuit. I’ve tried it on but haven’t made it to the pool yet. Just an FYI, the cut of the swimsuit on top is a bit more revealing than you might expect, especially compared to the pictures shown online. With no bust support at all, the wide V-neck shows a little more than you might be bargaining for in a swimsuit that has excellent moderate coverage on the bottom and in the back. The thickness of the fabric is great and it feels like great quality otherwise.